BUFFALO – Drew Stafford called it a “healthy separation.” The Winnipeg Jets winger said he has no ill will toward anyone here. He enjoyed his nine-year Sabres career. As a struggling veteran months away from free agency last year, Stafford knew the rebuilding Sabres would trade him. Sure enough, Stafford, 30, was dealt with defenseman Tyler Myers on Feb. 11, 2015 in the blockbuster that brought defenseman Zach Bogosian and winger Evander Kane to the Sabres. The change of scenery has reignited Stafford’s career, which stalled following a 31-goal campaign five years ago. The 2004 first-round pick has 20 goals in 71 games this season. Nine goals in 26 contests following the trade helped the Jets roar into the playoffs for the first time since they returned to Winnipeg in 2011. “The transition was very smooth,” Stafford said. Meanwhile, Myers, who’s out for the season, also acclimated to the Jets smoothly. For years, as Myers, 26, struggled to regain his slick rookie form and the Sabres became the NHL’s laughingstock, rumors swirled the 2009-10 Calder Trophy winner would be traded. Myers underwent knee surgery Thursday. The 2008 first-round pick will have major hip surgery, which requires 16 to 20 weeks of recovery, when his knee heals. “It’s come to a point where it just needs to be taken care of,” Myers said about his hip, which began bothering him with the Sabres. Myers accompanied the Jets to Buffalo because he’s visiting a doctor in New York. Stafford also holds some special memories of Buffalo. Walking into the First Niagara Center as a visitor was “definitely a little weird,” said Stafford, who experienced “the full circle of things” here. He joined the Sabres during their Presidents’ Trophy run and left at the end of their darkest days. “It looks like they’re really doing things right here turning this organization around,” he said. Stafford signed a two-year, $8.7 million contract with the Jets in the summer. “It was an easy choice to come back,” he said. When the Sabres honored Myers and Stafford with a video tribute, Stafford saluted the fans as they cheered and serenaded him with “Dreeewww” chants. While rookie Hudson Fasching’s debut garnered most of the attention – the winger scored a nifty goal 8:37 into the contest – defenseman Casey Nelson also enjoyed a strong first game, playing 16 minutes, 33 seconds and registering his first NHL point. The game surpassed Nelson’s expectations. 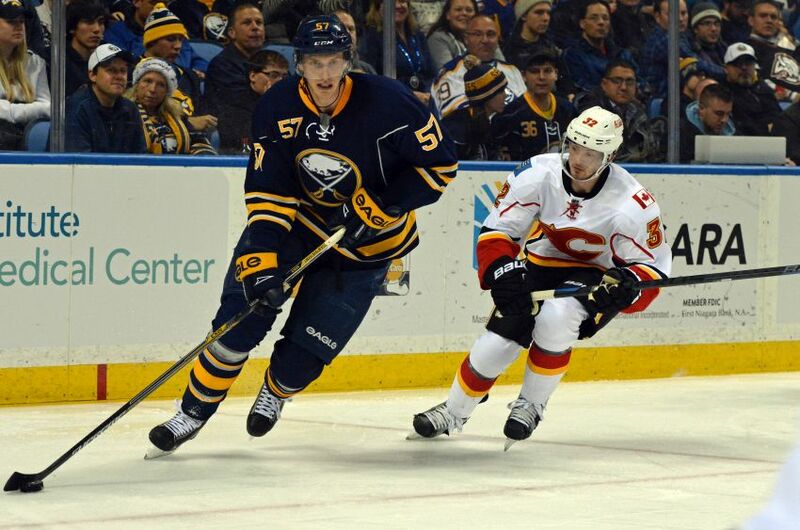 Nelson, 23, earned his first assist on Fasching’s goal by passing to Mark Pysyk in his own zone. As Fasching zoomed to the net, Nelson watched the play unfold on the video board. “A little different, but, yeah, pretty cool,” said Nelson, who signed an entry-level contract Tuesday after playing three seasons at Minnesota State University. Nelson said he slept well prior to the game, but he woke up and “the sweat starting hitting me.” He tried to calm down during the national anthem and finally settled in after the first period. Sabres coach Dan Bylsma even awarded Nelson some power-play duty. “He was skating well, distributing well, moving to the middle of the ice … (and) was fine defending,” Bylsma said. Fasching and Nelson became the first Sabres to record their first point on the same goal since Alexander Mogilny and Dave Snuggerud on Oct. 5, 1989 against the Quebec Nordiques. Notes: With his third-period goal, center Jack Eichel, 19, became the first Sabres rookie since Derek Plante in 1993-94 to hit the 50-point mark. He’s the youngest since defenseman Phil Housley in 1982-83. … After allowing two goals on the first four shots he faced, Sabres goalie Chad Johnson made 15 straight saves. … Winger Joel Armia, the Sabres’ 2011 first-rounder, played his 36th game with the Jets. The Finn was also part of last year’s trade. He played one game for the Sabres last season.